Mt. Hood, OR – Oregon’s Mt. Hood Meadows will have a lot to celebrate this 50th anniversary season, with a new lift, day lodge remodel, two new snowcats and a remodeled Demo Center, along with other improvements. Chief Operating Officer Jake Bolland describes these investments as significant and is excited about welcoming winter recreationists back to their mountain home this season. The 50th Anniversary celebration will commemorate and honor the achievements of Meadows since it opened in January of 1968. There will be special events, special lift ticket deals, a Golden Ticket promotion and a huge party on January 27, 2018, culminating with the awarding of a 50-year season pass. Mt. Hood Meadows will replace its Buttercup beginner chairlift this season with a SkyTrac fixed grip quad that doubles the uphill capacity. 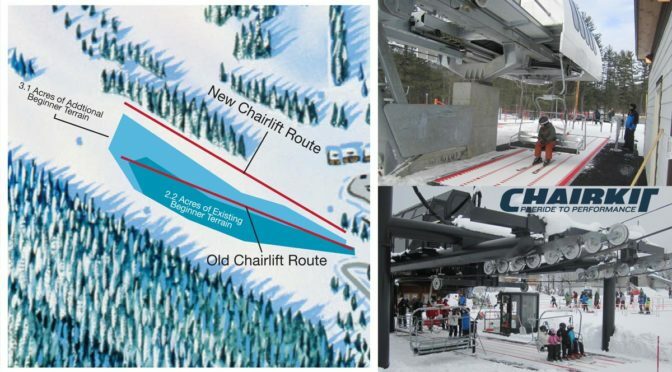 The new lift will feature a ChairKit loading carpet – a conveyor that makes it easier for beginners to load, particularly children, with an automated chair seat height adjustment. A realignment of the lift also opens up much needed learning terrain, more than doubling the amount accessed in the past with an additional 3.1 acres. With the loading carpet, overall lift efficiency is also expected to increase through the reduction of slowdowns or stoppages due to misloads. The first time experience will be enriched this season at Meadows with terrain learning features. The features are very subtle, and designed to assist beginners in making turns on their initial runs. The berms and rollers are being added to the beginner terrain next to the Ballroom Carpet over the snow conveyor, as well as in the area of the Buttercup beginner chairlift. Meadows trial tested the terrain learning features at the end of last season, and the first timers raved about how easily they advanced to gliding down the slopes. Helping beginners reach a level where they can have fun more quickly is the goal of this program. Meadows will also increase its grooming fleet by 15% this season with the purchase of two new Pisten Bully snowcats – a PB 400 for general trail grooming and a Park Pro 400 to enhance the resort’s terrain parks. With last year’s construction of a vehicle maintenance facility, Meadows now has the capacity to maintain more grooming machines in its fleet. The base facility at Hood River Meadows is being remodeled to provide expanded seating and more culinary options for guests. The remodel will also increase throughput for those purchasing their lift tickets at the facility. Last season the HRM lodge expanded its culinary offerings with a food truck, and now this season the remodel will allow for much more seating. While the lodge doesn’t offer rental equipment or lessons, the restrooms, day lockers, ticket sales and cafe make it the perfect access point for fast tracking to the lift. The remodel will accommodate more guests more efficiently. The High Performance Center at Mt. Hood Meadows will be remodeled this season to accommodate a new Wintersteiger Scout tuning machine and completely new fleet of demo equipment. The remodel improves the flow for those dropping off and picking up equipment for tuning, while better accommodating those demoing equipment or purchasing new equipment in the retail shop. In the past, everyone going to the facility entered through one door, whether they intended to demo, get equipment tuned or purchase equipment. The remodel provides separate queues for demo equipment and tuning / repair, creating better flow. Finally, guests will be able to view live video streams this season from high-definition cameras located at the top of the Blue lift and the bottom of the Vista Express lift. The new live streaming capability at Mt. Hood Meadows is made possible through a partnership with Toyota.